All spacecraft have been mission specific and evolve to address new data and technologies. In that aspect the Galleas represents the paradigm shift from one accepted technique to the next. Fascinating stuff. Do you know where the names galleass and galleon came from, by any chance? Clearly derived from galley in some way, but do the suffixes mean something in naval terms? Citizen Joe - Yes. People in the early 16th century assumed that 'battles of the future' would be fought essentially as in the past, but with a lot more gunfire in the opening rounds, that might sometimes prove decisive. It took time and combat experience to discover that the new technology called for entirely new tactics including a new arrangement of armament (elevating the previous secondary armament to a primary role). Carla - Both words are indeed derived from 'galley,' but the suffixes don't seem to have any special naval meaning. Galeazzo in Italian seems to have meant a large galley (and is also a personal name), but the situation is hazier for galeone (or galeon in Spanish), which seems to have a less fixed initial meaning. Ah, a historical analogy used to illistrate how technology has a way of evolving in ways unexpected by even those who invent or develop it! The original space capsules had only one purpose...getting a couple of people into and out of orbit...then they evolved into carrying people to the moon and back, or carrying cargo into orbit...the shuttle was the first spacecraft to be designed as a general purpose transport...I'm sure that sometime in the near future, someone will design a multipurpose interplanetary spacecraft that will evolve into who-knows-what deep-space vehicles. I think that it is a useful tool for speculative fiction as well. Story wise, sometimes weird technologies are needed to may the plot go. If you can hit the key points to link current technology to the future tech, that goes a long way to supporting the suspension of disbelief. Personally, I would love to see a few chapters in the back of a scifi novel that describes the history of some of the gizmos they use in common place during the story. Maybe put endnotes in or something. Another technique would be interspersing technical readouts between story chapters. Exactamundo to both comments. Major tech revolutions are full of unexpected uses of new technology - the outstanding modern example is the Internet, which has amazingly little relationship to anything that people in the 60s thought of 'future computers' as doing. The galleass was a technology developed to solve one set of problems, but it turned out to have totally unexpected capabilities, and so evolved in ways that surely would have surprised the first generation of designers and users. In my Human Sphere setting (currently on the back burner), large interstellar warcraft are still called 'survey ships' because of their technological ancestry in exploratory craft that had launching and control facilities for probes, which proved readily adaptable to missiles. It´s interesting how most technologies begin with one use and end being used in a diferent way than what was initially intended. As an analogy, something similar may be happening today with frigates (or destroyers) becoming the main combat vessel in most navies, or with figther-bombers being the only combat aircraft in most airforces. However at the same time we have an increasing number of non-combat heavily specialized military ships or aircraft. Rick said: "Yes. People in the early 16th century assumed that 'battles of the future' would be fought essentially as in the past..."
We are always fighting the last war, and that for one good reason: until a new technology is actually battle-tested, we have NO idea how it will hold up on the field of battle. Oddly enough, there's always someone who actually has the foresight to see what the hidden potential of those new technologies are. They are rarely listened to, and when they are, it is the enemy that listens best. The US army refused to adopt the Henry repeating rifle. Custer discovered that Sitting Bull understood its value. General De Gaulle envisioned a greater role for the tank. The French did not listen, but German General Guderian did. Admiral Nimitz understood the carrier would change naval warfare, but the US navy was still in love with the battleship. Admiral Yamamoto lead the assault on Pearl Harbor with his carrier and sank most of the battleships at anchor. "...you would have a ship sail against the wind, and against the current by lighting a bonfire under her deck? I have no time for such nonsense..."
Yes, Napoleon was offered the plans for the first steam-powered vessel. He refused it. Biting ironies such as this is what history is made of. I doubt it is going to be any different... IN SPACE! I'm quite sure it will be NO different in space! Forgot to add re qwert's comment, an upcoming post will deal with the flip side situation, new concepts implemented with established technology. Well the point is that doubt is never unjustified. Those are always new technologies, and armies, because of their necessarily hierarchical nature, are generally conservative and resistant to change. The victorious armies even more so: hey we won LAST time with those! The generals offered the new guns were the captains who used the old guns. They understand the old ones, they don't understand the new ones. That has hardly changed. The US navy is currently in love with Supercarriers. Most other naval forces are concentrating on low-profile missile cruisers. P.S. Actually Napoleon III had a great new weapon, which he was very enthusiastic about: Joseph Montigny's Mitrailleuse machine-gun, a 37-barreled breech-loading gun reminiscent of the Gatling and capable of firing 444 rounds a minute. It was fielded by poorly-trained men. Yes, it usually takes time until the best way to use a new technology is discovered and warfare offers a lot of wery dramatic examples of this. During WWI tanks were designed and built with the idea of supporting infantry operations rather than leading assaults. This was the reason why most allied powers essentially used them in the same way during the begining of WWII. However I think its fair to say that you can not tell how the future is going to come out and the past usually offers the best experience. That´s the reason why most weapon systems being researched today are already obsoleted by current warfare. In spanish, ending a word with on usually means a bigger than usual thing. 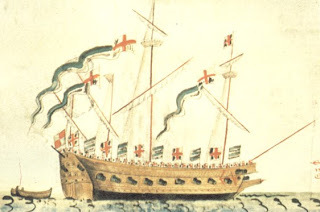 So "galeón" may simply mean bigger galley ("galera") in spanish. Both warships and combat aircraft are expensive; purchasing multirole combat platforms only makes sense, you fill all the needed missions with one package. I don't see combat spacecraft being any different. The subject of support craft, however, isn't about an all-round-pretty-good system, but something that can do it's job (a very specific job) as well as can be made to do so; one really good dedicated tanker can service several warplanes a day; one dedicated electronics ship can support an entire taskforce; specializing support craft means you can have less of each kind to support each mission; multirole combat ships and planes means that you can purchase more and still cover all possibilities instead of having a small number of very expensive specialized units; large numbers of multirole units means that while each one can do all the missions needed, it isn't the best at any one; however, you can detail several to each situation, instead of one or two. I see combat spacecraft as evolving in a simular manner. Well, if you look a bit to past developments, it seems that most new systems star with a specific purpose. Then some of these becomes with time more effective and is able to replace others which it was supposed to suplement. In the case of space warfare something similar may happen. You start with satelites for specific tasks like reconaissance, surface bombing or missile defnese. Then new antisatelite-satelites are developed in order to counter these first ones. Finally you only have one tipe of combat satelite which is capable of striking both, missiles and other satelites as well as launch attacks against the surface. Also, we (naturally) write history backwards, so to speak, and thus focus on the brilliant ideas that were not adopted, rather than the ones that were adopted, or for that matter the bad ideas that were. But one familiar example of the latter is the Germans and the V-2. They spent Manhattan Project equivalent money on something that was technologically brilliant but almost completely ineffective as a weapon. If the Nazis hadn't despised 'Jewish physics' there might have been a very different story. qwert - 'Bigger galley' would make sense in terms of the original conception, and fits with the Italian equivalent word. These were probably an Iberian development, though their early history is very obscure. Ferrell - If anything, combat spacecraft will be even more so, very expensive, imposing tough choices on designers and policymakers when it comes to specialized versus multi-mission vehicles. qwert (crosspost as I was replying) - The development sequence you outline seems entirely likely! We're already talking about weaponizing space! In a twisted rebirth of the "Star Wars" project, the infamous "Rods From God" project would consist of orbiting a kinetic bombardment platform. In a fantastic demonstration of hypocrisy, the US could be planning to circumvent its own SALT accords in order to place nuclear-yield, if not nuclear-armed, weapons in orbit. Talk about following the letter of the law while crushing its spirit. If such a project was ever implemented we'd see a rapid evolution of anti-satellite weaponry, either ground or satellite based. How the release of such a weapon could be viewed as anything other than a nuclear-type first strike and therefore not cause an escalation is another wall-banger. Things like that are proof that yes, yes we will bring war with us to space. Specialization v. multi-mission: The B2 bomber is very much a specialized vehicle, and at 2 billion dollar a piece we've proven that just because a weapon is ridiculously expensive (and of doubtful use even in its special niche) it doesn't mean that it won't be built. Military organizations are not concerned about profitability, so assigning straight economic reasons for not building a weapon are just willful blindness. For a quick comparison: a B2 bomber costs 2 billion. A supercarrier costs 5 billion, so a B2 costs nearly half a carrier! Speaking of supercarriers: despite their 5 billion individual cost, and the fact that there are 8 currently operational (that's 8 more than anyone else who even *has* a carrier) we are still building more. The weapons we develop in space are not going to be limited by unit cost. They're going to be motivated by political factors, from the personal tastes of the generals in charge of budget to the decisions of Senators under whose jurisdiction falls the employees of the arms developer. It won't matter if a single-role battleship costs 10 billion dollars while a dozen multi-role frigates come to a total of 5, in a system of "battleship mentality" the battleship is built. "...The weapons we develop in space are not going to be limited by unit cost. They're going to be motivated by political factors, from the personal tastes of the generals in charge of budget to the decisions of Senators under whose jurisdiction falls the employees of the arms developer. It won't matter if a single-role battleship costs 10 billion dollars while a dozen multi-role frigates come to a total of 5, in a system of "battleship mentality" the battleship is built..."
I doubt that the "Rods of God" will be build in the near future. The costs involved are too big and its utility is dubious. There doesn´t seem to exist the political will for it neither. I don´t thing that more supecarriers are necesary, however i dont think they are useless neither. They provide for excelent mobile forward operating bases for strike aircraft, which in turn allows for shorter reaction times. Excellent for targets which tend to hide quickly. And they aren´t an easy target for terrorists (as long as the carrier stays on high sea). Other navies (notably France and UK) are also considering to build their own supercarriers. You are forgeting one of the main reasons why politicians support certain systems over others: Its the number of jobs it will create in the country, state or city they represent. Now how usefull each taxpayer dollar is (after all most taxpayer live outside your territory, they could well subsidize your ellection). "Other navies (notably France and UK) are also considering to build their own supercarriers." France: Charles De Gaulle 42,000 tonnes, nuclear. Russia: Admiral Kuznetsov 67,500 tonnes. non-nuclear. U.S.A: Enterprise 93,500 tonnes, nuclear. 10 Nimitz-class 101,000 tonnes, nuclear. China: Kuznetsov-class carrier, purchased through front company as a "casino", currently under refit bearing PLAN colors. Russia: Undefined plans but up to 6, 50,000 tonnes. Great Britain: Queen Elizabeth and Prince of Wales 65,000 tonnes, non-nuclear. Even looking at future international carrier and supercarrier development, the number of units operated by the U.S Navy far outstrips not only individual navies (including allies) but all other navies combined, in numbers alone. In terms of tonnage, the discrepancy is even greater. qwert, you're right about the motives of politicians: "...You are forgeting one of the main reasons why politicians support certain systems over others: Its the number of jobs it will create in the country, state or city they represent. Now how usefull each taxpayer dollar is (after all most taxpayer live outside your territory, they could well subsidize your ellection)." Jean - I'll quibble that 'Rods from Gods' won't have anything like nuclear yield unless they are Really Huge rods. A one ton impactor hitting at orbital velocity has kinetic energy equal to about 7 tons of TNT. That said, the idea is abysmally stupid - it is the US interest, as the leading spacefaring power, to forestall weaponization of space as long as possible, not hasten it along. qwert - The USN carrier force does indeed make sense given a) the technology of the last 60 years, and b) the hegemonic maritime role the US has been in a position to exert. The carriers are intended not primarily to fight other navies but to 'project' power. The next 25 years are likely to be another matter, as manned attack aircraft become obsolescent, and as emergent Great Powers - China, India, potentially the EU - make hegemony unsustainable. The US interest (IMHO) is to foster as much as possible a 'concert' of Great Powers. If there's anything to the democratic peace theory, and I think there is, relations among the US, India, and EU should be essentially good. China is authoritarian and Russia is demi-authoritarian, which makes relations more guarded, but there's no inherent reason for them to be rivals/enemies. In the postindustrial age all Great Powers have an inherent primary interest in a stable world. Ferrell - Yep, domestic politics, jobs and also nationalistic pandering, play a huge role in determining military procurement. Viewed on one level the 1960s space race was silly, but on another level it was an effective form of chest beating that was not overtly military. In that respect you could say that going to Mars does two useful things for the US - it allows us to do the We're Number One end zone dance, and do it in a way that does not threaten people.